Abstract: Inside PreK Classrooms provides school leaders with much-needed guidance and knowledge to ensure quality instruction for their youngest students. Based on their extensive experience working with children and educators, the authors bring readers inside real classrooms, where teachers are grappling with the “big ideas” that lie at the core of quality preK instruction. The authors examine historical shifts in early education and the most recent research to argue for an expanded view of the capacity of preschoolers. They focus on critical issues in guiding instruction, such as which skills are best taught in whole-group versus small-group settings, and the value of one-on-one conversations between teachers and students. In addition, the book offers concrete recommendations that help school leaders work more effectively with preK teachers. 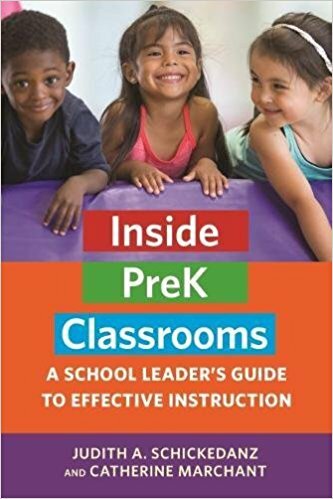 Inside PreK Classrooms tackles some of the most contentious debates in early childhood education, including how preK teachers can meet state standards while honoring their traditional priorities of helping young children develop social and emotional skills and adjust to school routines. Full of wisdom and insights gleaned from decades of experience immersed in research and practice, this book provides a critical resource for school leaders and educators concerned with increasing access to quality preK education.